The developers of the would-be Village at Wolf Creek will stop at nothing. We know that. But we really do expect the Forest Service to manage public lands in the public interest and not cave to the pressure of billionaire developers. We will fight this as we have fought so many previous rounds. The good news is, thus far, the public interest has won. Despite over 30 years of effort, not a single condo has been built atop Wolf Creek Pass. And that is because so many of you have spoken out and supported our work on this. We will continue in this latest round. Stay tuned, we’ll let you know how you can help. Meanwhile, here’s our press release on the latest development. You can also read the Durango Herald article for more details. 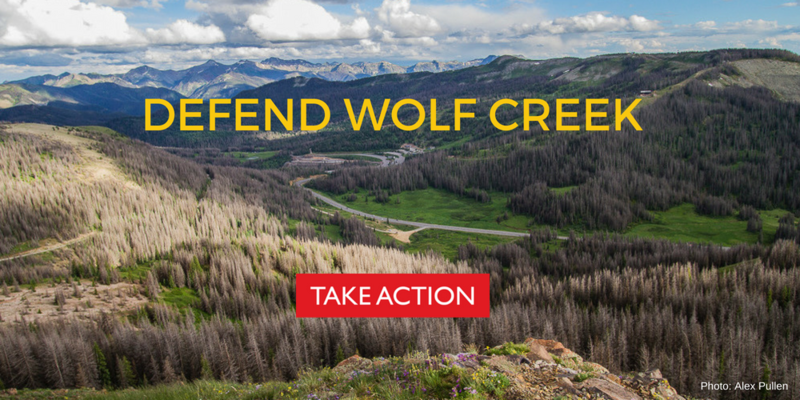 The Rio Grande National Forest announced its intention July 19, 2018 to circumvent a federal court ruling that invalidated prior approvals for the controversial Village at Wolf Creek real estate development. The Village at Wolf Creek is a planned massive real estate development located atop Wolf Creek Pass that would house up to 8,000 people in as many as 2,000 housing units. It has been mired in controversy for 30 years, and courts have repeatedly stymied attempts by the developers to fast track approvals or short-circuit environmental studies and public input. Not only is the Forest Service bulling ahead in violation of legal decisions, it is cutting out the public in its latest decision. The Forest Services hopes to prevent the public from reviewing new biological information by fast tracking the approval process. Please keep up the good fight. We don’t have the natural resources to support this travesty. Dan Dallas’ craven submission, while consistent, disappoints. Note to the Billionaire Boys Club and Corporate America: Colorado is not a sacrifice zone.